So to begin with, the entire activity of financial trading in this space should probably be called blockchain trading as not all the assets being traded are necessarily cryptocurrencies. For e.g. one of the top 5 traded coins is “Ripple” which was designed purely to enable financial transfers within the banking and financial system. Some other coins are focused on enabling b2b commerce or authenticating contracts. So let’s understand that not all blockchain based entities are necessarily “cryptocurrency” in the traditional sense that we use them to buy coffee someday. Some other popular coins are Bitcoin, Ether, Litecoin and hundreds more. In most cases there is no central entity controlling them. Once they are created (or mined) they are out there and keep varying in value. There is also an ongoing debate whether traditional “cryptocurrencies” such as BitCoin are truly currencies or a form of digital gold. Until widespread use of cryptocurrency for purchase and consumption of everyday goods becomes common, this debate will likely continue as the cryptocurrency holds value today largely when backed up by “fiat currency” (common currency) issued by a government. Most commonly US$. Is cryptocurrency trading legal in India? Here’s where it starts to get interesting. There is no law making it expressedly illegal. But when someone trades large amounts on an international exchange, one could argue that they start skirting the borders of several legacy laws such as FEMA which simply did not take digital currency into consideration. Today, digital currencies can be bought on Indian exchanges or digitally “mined” and carried on innocuous hardware like secure USB keys. They can also be digitally transferred into international wallets, traded and transferred back. This obviously represents several headaches for governments as it can go around the world without getting tracked. Initially governments around the world tried to crack down on cryptocurrency. But they soon found that this was a losing game as it was impossible to police, given its decentralized nature. Now they are realizing that it is probably better to regulate and not worry about what’s happening while it’s on the internet. If governments can regulate it at the point where it is cashed for fiat currency like INR, then they stand to make a windfall from taxes collected which one imagines will be substantial. The RBI has however, warned the Indian public to stay away from cryptocurrencies, as they are prone to creating asset bubbles. This has set off a sort of proxy war by the banks on behalf of the RBI. Private banks in particular are taking the safe way out and restricting access to crypto exchanges. There are also reports of accounts actually being shut down, if found linked to crypto trading. All this is bound to be temporary in nature and the government is soon expected to outline its policy on the matter. Then there are some people who visualize cryptocurrency as upsetting the entire world economic order. Which is not entirely fanciful thinking. A lot of the current world order is implicitly maintained through clever post war manipulations like the Bretton Woods agreement and institutions like the IMF and World Bank, which made US$ the global standard and continued to keep it so, even when the US government delinked the US$ from gold in the 70s. This has allowed a coterie of western nations to pretty much control the economic fate of several countries for decades. If cryptocurrency gains favor, that control evaporates. But this is unlikely to happen without a desperate fight. Case in point are the several wars that were fought in the middle east, ostensibly to bring “democracy” but often because the oil rich nation threatened to trade oil in some currency other than the US$. Is this world order set to change? We can only wait and see. But nations such as Venezuela are happy to embrace cryptocurrency for this very reason. Coming to the question on every mind. 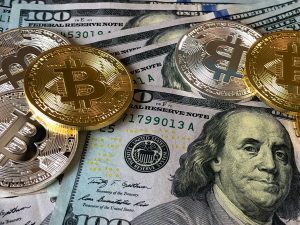 Is there money to be made in crypto trading? Well, it is a fact that some people have already made fabulous amounts of money in crypto trading. Almost unimaginable returns ranging from 200 to 3000% and in some cases even more. So is this a huge asset bubble? Nobody knows? Is it going to crash? Again no one knows. But the number of people joining the party is huge. Indian and international exchanges like Koinex and Binance are witnessing millions of new users being added every month. In fact many of them could not scale and had to suspend new user registrations for weeks together while customers impatiently waited with money in their hands! Tokens like Ripple are witnessing lakhs of transactions every day on Indian exchanges. And it’s not just the tech savvy who are on the bandwagon. A cursory glance of any crypto trading group reveals a melting pot of socio economic classes, including businessmen and traders who deal in crores as well as scores of ordinary people who may not even fathom the technology and are putting in small amounts like 2 or 5 thousand rupees in a desperate attempt to double it in a month, because someone has told them so. Often they get stuck at every stage, including currency deposit into the exchange and so on. One even hears of seminars being organized in small towns where various versions of “give me your money and I’ll double it” sort of shady deals are being perpetrated. The only folks who really seem to understand this animal appear to be the 20 something geeks. Now seasoned older investors who spent years turning up their noses at these geeks and their “games” are beating a beeline to their doorstep as “FOMO” (fear of missing out) takes over. The catch here is that while equity trading and crypto trading may appear similar in many ways, they are fundamentally different. The reason 20 yos are so good at crypto trading is because the price movements are fundamentally based on 2 things as far as we can see. One, news flows on social media about upcoming use cases. And two, the visual spatial-trick of chart reading and volumes which predict when the crowd is going to act and in which manner. And it’s all instant. Real time. Blink and you lose. Unless you are plugged into every possible electronic news feed from reddit to twitter and private chat rooms, you are likely to miss the news that spikes the price within minutes. This also means that most crypto traders spend sleepless nights & days stuck to their screens, as this is a 365 x24 x 7 activity that never ceases. So is this a giant fireball that is going to crash and burn someday? Yes and no. Cryptocurrencies look like they are here to stay because they are not controllable by traditional government models. The entire concept is somewhat anarchist in that sense. But not all will survive and many will lose their entire store of value. It is important to appreciate though, that crypto currencies also represent a real opportunity, especially for developing nations, to counter unfair trade practices based on predatory monetary policies of entrenched powers. The technology also holds the potential to rapidly bring the unbanked into a formal monetary system using ubiquitous mobile phone technology instead of waiting for a bank to open a physical branch somewhere. So to blindly see it as a threat to the established world order would certainly be short sighted. This entry was posted in Economy, finance and tagged bitcoin, crypto, cryptocurrency, India, ripple, xrp. Bookmark the permalink.